Led by longtime friends Ed Woltil and Brian Merrill, two of the Tampa music scene’s leading lights, The Ditchflowers represent a rare convergence of talent coming together in the right place at the right time. Former frontman of Big Deal recording artists Barely Pink, Merrill fuses craft and showmanship. His music has been featured in broadcasts by such diverse outlets as the XGames on ESPN, the Disney Channel and the Tokyo Broadcasting System. Award-winning songwriter and multi-instrumentalist Ed Woltil channels inspired melodicism and riveting musicianship. 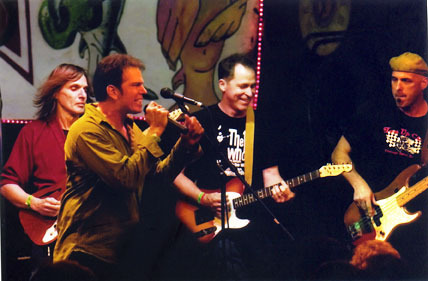 Whether leading Tampa Bay power pop savants, Mad For Electra, or playing rhythm guitar with Florida’s legendary Headlights (Roger McGuinn’s one-time backing band), Woltil has charmed audiences and critics alike. The Ditchflowers lineup is rounded out by fellow Headlights alum Steve Connelly (cited by Creative Loafing as both “the linchpin of the Tampa Americana scene” and “the premier guitarist in Tampa Bay for the past thirty years”); the nimble yet powerful bass stylings of ex-Barely Pink bassist Michael Hoag; and the powerful addition in 2012 of drummer Aaron Kant. Kant, who cut his teeth in the Tampa Bay Area, has been working as a drummer and a producer in New York City since the late nineties, playing with bands, and backing up various artists, including Michael Stipe and Angelo Moore from Fishbone. He fell into The Ditchflowers dimension after misreading a sign on his drive back from New York City.